The Upper Disang-Lower Barail Transition Sequences of Nagaland in northeast India, Indo-Myanmar Ranges (IMR) are found to preserve reasonably diverse biological sedimentary structures. Three ichnofacies were observed, Skolithos ichnofacies consisting of Bergaueria hemispherica, Gyrochorte comosa, Ophiomorpha nodosa, Skolithos linearis and Thalassinoides paradoxicus; Cruziana ichnofacies — Curvolithus simplex, Scolicia plana, Scolicia strozzii, Scolicia vertebralis, Treptichnus pedum, Taenidium diesingi and Palaeophycus tubularis; and Nereites ichnofacies — Chondrites targionii and Paleomeandron elegans. Presence of Skolithos and Cruziana ichnofacies suggest well oxidising, substrate rich depositional environment in the foreshoreface to offshore setting in general; and an overall possible fluctuation in the depositional bathymetry which is supported by the presence of Nereites ichnofacies in horizons alternating with Skolithos and Cruziana ichnofacies. The depositional system is proposed to be proximal to distal hyperpycnal-delta-fed turbidite system. Observation of sand spherules also suggests possibility of shoreline as one of the depositional environments. Lokho, K., Singh, B.P. Kazhakielie Whiso, K. O. and Ezung, C. (2017) Ichnology of the Laisong Formation (late Eocene-early Oligocene) of the Naga Hills, Indo-Burma range (IBR): Paleoenvironmental signiûcance. Jour. Asian Earth Sci., DOI: https://doi.org/10.1016/j.jseaes.2017.12.019. Soibam, I, Khuman, Ch.M. 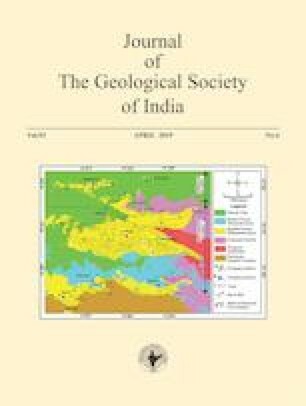 and Sanasam, S.S. (2015) Ophiolitic rocks of the Indo-Myanmar Ranges, NE India: relicts of an inverted and tectonically imbricated hyper-extended continental margin basin? In: G.M. Gibson, F. Roure and G. Manatschal (Eds. ), Sedimentary Basins and crustal processes at Continental Margins: From Modern Hyper-extended Margins to Deformed Ancient Analogues. Geol. Soc. London, Spec. Publ., 413p. DOI: https://doi.org/10.1144/SP413.12.